A few years ago I walked into Pier One during one of their “pretty” merchandise seasons (as opposed to the ugly seasons where I would run screaming from the store away from all the hideousness. You know you know what I’m talking about!) 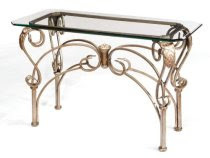 and found this beautiful scrolly wrought iron sofa table base. The trouble was, all Pier One offered in the way of tops were huge honking pieces of glass. 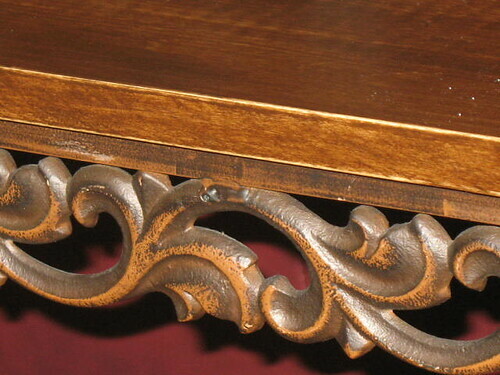 I’m just gonna put it out there–I don’t like glass topped tables. I don’t like the way they make my knicknacks appear to float in mid-air, plus I’d rather be playing on the internet than cleaning all the water rings and grimy toddler fingerprints off of my table tops. Glass tops + lazy housekeeper = nightmare. Since I don’t have any “before” photos of the piece with a glass top, here’s a glass topped sofa table as a point of reference. 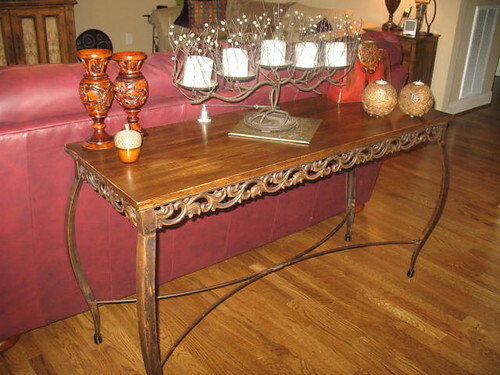 I loved the sofa table base so much that I decided I had to have it even without a top on it. I knew we could make something work. So we took it home and I commissioned my husband to make me a top for it. 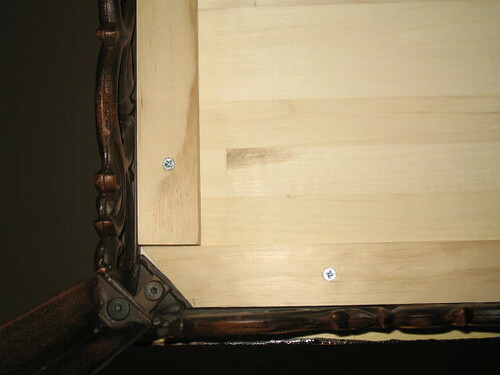 He cut it to fit the sofa table, then he added 1×2 strips to create a small lip around the edge for the table to fit down inside the base. And here it is from the bottom. He just used wood screws to attach the 1×2’s to the butcher block top. 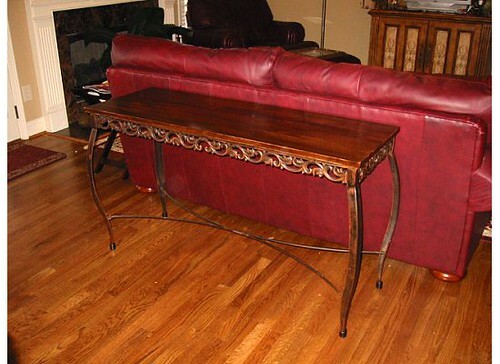 I wanted to match my hardwoods, so I chose Minwax Gel Stain in Chestnut. I’m going to admit something else– stains have always scared me. I always shied away from staining furniture because it just seemed so labor-intensive and I’ve seen too many bad drippy homemade stain jobs. But let me tell you–applying the gel stain was MUCH easier than I expected. It’s thicker than normal stain so it doesn’t drip and run everywhere in uneven gooeyness. The hardest part of staining a piece of furniture is sanding it all down in between coats and waiting for it all to dry completely each time. Like Tom Petty says, the waiting is the hardest part. But it’s pretty essential for getting a good finished product. After the first coat dried completely I used a piece of superfine grit sandpaper to sand it down by hand, then I used a damp cloth to wipe up the dust. Then on went the second coat of stain. I waited for it to dry and sanded it again, then repeated that process until I had quite a few layers of stain down. After I achieved the color I was looking for, I sanded it once more just to give it a little bit of a worn edge. I love worn edges. They are like the first ding in a new car. Once you get that first ding, it just takes all the pressure off of trying to keep things in pristine condition. For the grand finale I applied a final coat of clear polycrylic in a satin finish. 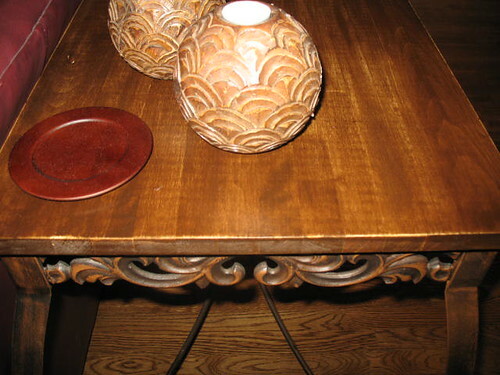 The satin is nice because it gives it a little shine but it’s not like WHOA your table is SHINY, you know? 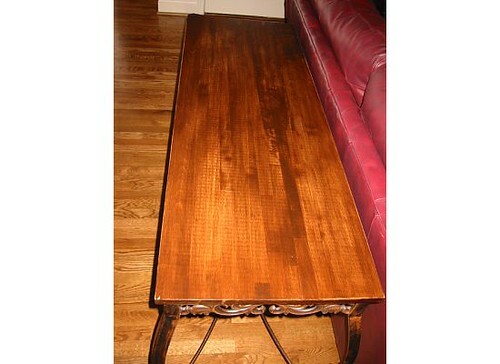 Once I got the table in my living room, I knew I had made the right call on going with a wood top instead of glass. I love this piece so much. I added some non-floating knicknacks and called it a day. Don’t be afraid of the stain! It’s not that bad, really! It looks really great with the wood top! Great idea! I refuse to have any glass top tables in my house for the same reason. Who needs to clean smudges all the time! I also totoally get what you are saying about Pier One having good and bad seasons! I know what you mean about the glass topped tables. I am not fond of them myself. They are nice to look at but if you have kids then they are a real pain in the behind. Love how the table turned out. It’s gorgeous. I know exactly what you mean by glass top tables. I don’t have kids myself but I like my furniture to be solid and I do love the look of wood. Thanks for showing this as now I can look at CraigList with a more open mind. It’s great you were able to take something mostly ready-made and fashion it to work. That’s my kind of project. 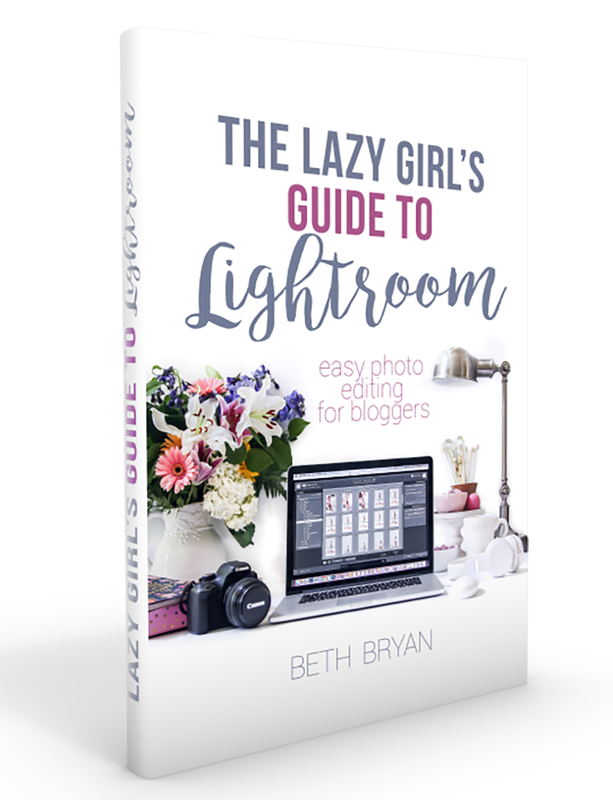 Custom work yet easy on the budget, the time and on the eye! It looks great! I’m not much of glass table fan either, and I know what you mean about Pier One’s “off seasons”. Sometimes they are a bit out there. I, too, don’t care for glass topped tables. 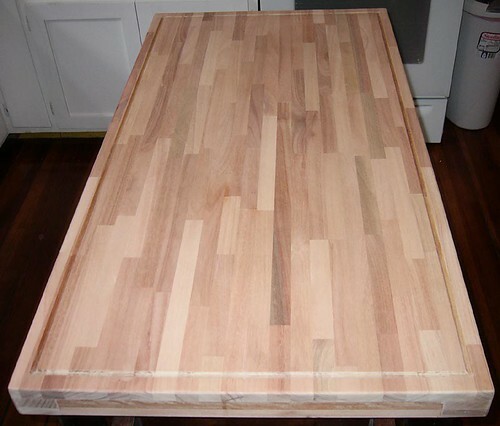 Your table top came out great!